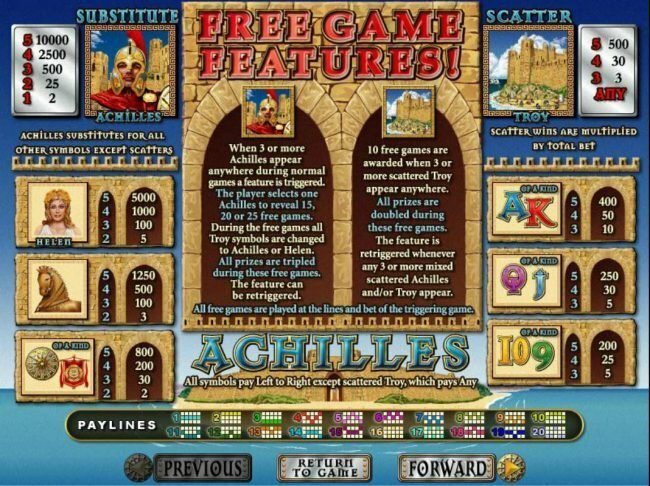 Achilles online slot machine pictures and slot feature list from RTG, play Achilles Slots for free. Achilles Slots 4 out of 5 based on 5 ratings. 5 user reviews. 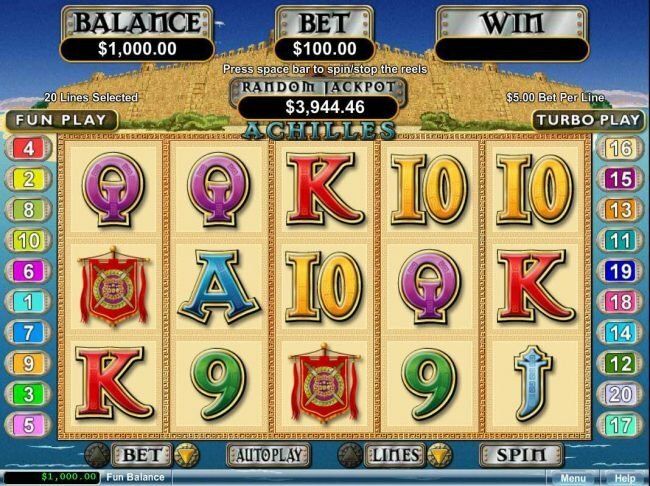 Achilles is a 5 reel, 20 payline progressive Slot from Real Time Gaming. It includes scatters, wilds, Free Spins as well as a random progressive jackpot. 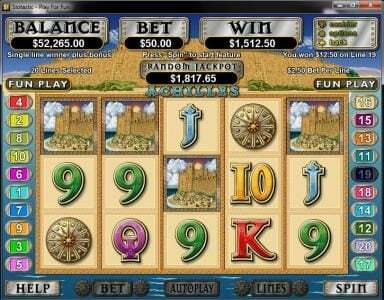 If you love history, specially the ancient roman times, when the Romans rules the land then you will love this slot. There is the fortress that fills the top of the screen and the ocean shoreline it sits in front as well as clouds and greenery that make up the background images in Achilles. As with any themed slot you will find many of the characters have been designed to reflect the period this slot has been designed around. This includes Helen, the battle horse, a shield, a battle flag and the usual letter symbols and number symbols. Achilles acts as the wild and the City of Troy is your scatter. Each symbol has design elements that are meant to take you back to a time when life and survival was brutal and the warriors were idolized. The minimum coin size is $0.01 and the max is $1 per line making the maximum bet set at $20. The Achilles symbol will be your wild symbol. While it does not come with a multiplier it will substitute for the base game symbols found within the game. It can also appear on all 5 reels allowing for a top pay of 10,000 coins. It will also pay 2500 coins should four appear on an active payline, 500 coins for three, 25 coins for 2 and 2 coins for 1. As there are 20 paylines in this slot even getting one on the first reel can result in multiple winning lines. When 3 or more appear you then will be able to select one to be rewarded with as many 25 spins. All free spins that are awarded by the Achilles symbol will come with a multiplier of three. The free spins can be won again during the initial free spins that were awarded. The scattered Troy symbol will award ten free spins when 3 or more of these appear in any position across the reels. 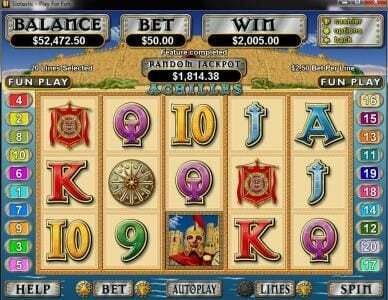 The benefit to this series of free spins is that whenever three or more of the troy appear or a combination of the troy and Achilles symbols appears you will win an additional 10 free spins. This can occur multiple times without a maximum number of free spins that can be won. The progressive jackpot is awarded at random at the conclusion of any spin. The amount that was wagered has no bearing on the ability to win the progressive jackpot as it is in play whether you wager the lowest amount or the maximum amount. 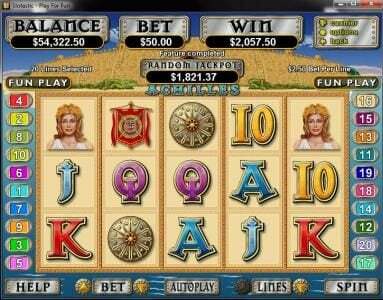 This is a solid and well designed slot that offers some great potential for big wins let alone of jackpot to boot. Be sure you do not use multiple free casino promotions as your balance may be removed without making a deposit. Be sure when you use a free bonus code from Sloto Cash as you know with operated online casinos, you must make a qualifying deposit between no deposit casino promotions. Do not use multiple free casino bonuses back to back as they may not pay you for violating terms and conditions. Be sure when you use a free Casino Bonus code from Cherry Gold as you know with RTG operated Online Casinos, you must post a deposit between free Online Casino Bonuses. Be sure when you use a free bonus code from Club Player as you know with RTG run casinos, you must post a deposit if your last bonus was a free one. American Samoa, Andorra, Anguilla, Aruba, Austria, Barbados, Belgium, Bermuda, British Virgin Islands, Cayman Islands, Chile, Cook Islands, Finland, Greece, Iceland, Luxembourg, Marshall Islands, Martinique, Mayotte, Mexico, Monaco, Montserrat, New Caledonia, Niue, Norfolk Island, Northern Mariana Islands, Portugal, Puerto Rico, San Marino, South Africa, Spain, Sweden, Switzerland, Tokelau, Uruguay and Venezuela locations are forbidden at Club Player Casino. Intertops requires that you have to make a qualifying deposit between multiple no deposit casino bonuses to be allowed to process a withdraw. Do not use more than one no deposit bonus back to back as your winnings could be removed without a deposit. Royal Ace is prohibited in American Samoa, Andorra, Argentina, Aruba, Australia, Austria, Barbados, Belgium, Bermuda, British Virgin Islands, Cayman Islands, Chile, Cook Islands, Finland, Germany, Greece, Guam, Iceland, Japan, Luxembourg, Marshall Islands, Martinique, Mayotte, Mexico, Monaco, Montserrat, New Caledonia, New Zealand, Niue, Norfolk Island, Northern Mariana Islands, Norway, Portugal, Puerto Rico, San Marino, South Africa, Spain, Sweden, Switzerland, Tokelau, United Kingdom, United States, Uruguay and Venezuela locations. Do not use multiple Free Casino Bonuses as they may not pay you for not following terms. Note that American Samoa, Andorra, Anguilla, Argentina, Aruba, Australia, Austria, Barbados, Belgium, Bermuda, British Virgin Islands, Cayman Islands, Chile, Cook Islands, Finland, Germany, Greece, Guam, Iceland, Japan, Luxembourg, Marshall Islands, Martinique, Mayotte, Mexico, Monaco, Montserrat, New Caledonia, New Zealand, Niue, Norfolk Island, Northern Mariana Islands, Norway, San Marino, South Africa, Spain, Sweden, Switzerland, Tokelau, United Kingdom, United States and Venezuela players are restricted at Planet 7 casino. Do not use more than one free promotion back to back as your winnings could be removed without making a deposit. Note that Chile, Denmark, Finland, Japan, Philippines, Poland, South Africa and Turkey players are not permitted to play at Diamond reels. Be sure when you use a No Deposit Casino bonus code from Grande Vegas as you know with RTG run casinos, you have to make a deposit between no deposit casino promotions. American Samoa, Andorra, Anguilla, Aruba, Austria, Barbados, Belgium, Bermuda, British Virgin Islands, Cayman Islands, Chile, Cook Islands, Finland, Greece, Iceland, Luxembourg, Marshall Islands, Martinique, Mayotte, Mexico, Monaco, Montserrat, New Caledonia, Niue, Norfolk Island, Northern Mariana Islands, Portugal, Puerto Rico, San Marino, South Africa, Spain, Sweden, Switzerland, Tokelau, Uruguay and Venezuela locations are forbidden at Club Player. Be sure you do not use multiple free promotions back to back as your winnings could be voided without making a deposit. Slot Madness terms state that you have to make a deposit between multiple free Bonuses to be allowed to make a cash out. Note that American Samoa, Andorra, Anguilla, Argentina, Aruba, Australia, Austria, Barbados, Belgium, Bermuda, British Virgin Islands, Cayman Islands, Chile, Cook Islands, Finland, Germany, Greece, Guam, Iceland, Japan, Luxembourg, Marshall Islands, Martinique, Mayotte, Mexico, Monaco, Montserrat, New Caledonia, New Zealand, Niue, Norfolk Island, Northern Mariana Islands, Norway, Portugal, Puerto Rico, San Marino, South Africa, Spain, Sweden, Switzerland, Tokelau, United Kingdom, United States, Uruguay and Venezuela players are not permitted to play at Slot Madness Casino. Do not use multiple free Casino promotions back to back as your winnings could be voided without making a deposit. Be sure you do not use more than one free Casino promotion back to back at Grande Vegas as your winnings could be voided without making a deposit. Grande Vegas requires that you have to make a deposit between no deposit bonuses to be allowed to make a withdraw. Do not use more than one free bonus back to back as your balance could be removed without a deposit. Do not use more than one free Casino promotion as they may not pay you for not following the rules. Do not use multiple no deposit promotions at Cherry Gold as your balance may be removed without a deposit. Be sure you do not use multiple No Deposit Casino promotions at Raging Bull as your balance may be voided without a deposit. Bolivia, Bosnia and Herzegovina, Botswana, Bulgaria, China, Costa Rica, Croatia, Czech Republic, Estonia, Israel, Latvia, Lithuania, Nigeria, Poland, Singapore, Slovenia, South Africa and Ukraine countries are restricted at Raging Bull. All Star Slots terms state that you must make a deposit between multiple no deposit casino bonuses to be allowed to make a withdraw. All Star Slots is prohibited in Costa Rica, France, Ireland, Isle of Man, Israel and United Kingdom countries. Do not use multiple no deposit promotions as they may not pay you for not following terms and conditions. Kudos requires that you must make a deposit between multiple Free Casino Bonuses to be allowed to process a withdraw. Be sure you do not use multiple free Bonuses back to back as your balance may be voided without making a deposit. Be sure you do not use more than one no deposit promotion at Grande Vegas as your winnings could be voided without a deposit. Do not use multiple free Bonuses at Casino Extreme as your balance could be voided without a deposit. Take care you do not use more than one No Deposit Casino bonus back to back at Grande Vegas as they may not pay you for violating the rules. Do not use multiple No Deposit Casino promotions back to back as your balance may be voided without a deposit. Slotastic terms state that you have to make a deposit between multiple no deposit casino bonuses to be allowed to process a withdraw. Be sure when you use a free bonus code from Raging Bull Casino as you know with RTG powered casinos, you are required to make a qualifying deposit between free casino promotions. Raging Bull casino is prohibited in Bolivia, Bosnia and Herzegovina, Botswana, Bulgaria, China, Costa Rica, Croatia, Czech Republic, Estonia, Israel, Latvia, Lithuania, Nigeria, Poland, Singapore, Slovenia, South Africa and Ukraine countries. Do not use multiple no deposit bonuses back to back as your winnings may be removed without a deposit. Do not use multiple No Deposit Casino promotions at La Riviera as your winnings could be removed without making a deposit. Do not use multiple free Bonuses back to back as your winnings could be removed without a deposit. Do not use more than one no deposit Casino promotion at Intertops as your balance could be voided without making a deposit. Do not use multiple no deposit promotions back to back at Kudos as they may not pay you for not following terms. Do not use more than one free casino promotion as they may not pay you for not following terms. Be sure when you use a free Casino Bonus code from Fair Go as with most RTG powered Online Casinos, you must post a deposit between free Online Casino Bonuses. Fair Go Casino is restricted in Bulgaria, Costa Rica, Denmark, Israel, Oman, Poland and Ukraine locations. Be sure you do not use more than one free casino promotion back to back as they may not pay you for violating terms and conditions. Bulgaria, Costa Rica, Denmark, Israel, Oman, Poland and Ukraine countries are restricted at Fair Go. Casino Extreme terms state that you have to make a deposit between no deposit bonuses to be allowed to process a cash out. Raging Bull terms state that you have to make a qualifying deposit between multiple no deposit casino bonuses to be allowed to make a cash out. Bolivia, Bosnia and Herzegovina, Botswana, Bulgaria, China, Costa Rica, Croatia, Czech Republic, Estonia, Israel, Latvia, Lithuania, Nigeria, Poland, Singapore, Slovenia, South Africa and Ukraine locations are not allowed to play at Raging Bull Casino. Be sure when you use a no deposit bonus code from Intertops as with most Proprietary operated casinos, you must make a deposit if your last Casino Bonus was also a free one. Do not use multiple free promotions back to back as they may not pay you for violating terms and conditions. Be sure you do not use more than one free bonus as they may not pay you for not following terms. Do not use more than one free bonus back to back at Raging Bull as they may not pay you for not following terms. Note that Bolivia, Bosnia and Herzegovina, Botswana, Bulgaria, China, Costa Rica, Croatia, Czech Republic, Estonia, Israel, Latvia, Lithuania, Nigeria, Poland, Singapore, Slovenia, South Africa and Ukraine players are not allowed to play at Raging Bull Casino. Do not use multiple Free Casino Bonuses as your winnings may be removed without a deposit. Be sure when you use a free casino bonus code from Grande Vegas casino as you know with RTG run Online Casinos, you have to post a deposit between no deposit online casino promotions. Be sure when you use a no deposit bonus code from Raging Bull as you know with RTG run casinos, you have to make a qualifying deposit if the last Casino Bonus was also a free one. Raging Bull is prohibited in Bolivia, Bosnia and Herzegovina, Botswana, Bulgaria, China, Costa Rica, Croatia, Czech Republic, Estonia, Israel, Latvia, Lithuania, Nigeria, Poland, Singapore, Slovenia, South Africa and Ukraine countries. Fair Go terms state that you have to make a deposit between no deposit bonuses to be qualified to process a cash out. Bulgaria, Costa Rica, Denmark, Israel, Oman, Poland and Ukraine countries are not able to play at Fair Go Casino. Be sure when you use a no deposit bonus code from Raging Bull as with most RTG powered Online Casinos, you have to make a deposit between free casino promotions. Be sure you do not use multiple no deposit promotions as they may not pay you for not following the rules. Sloto Cash requires that you must make a qualifying deposit between Free Casino Bonuses to be allowed to process a cash out. Take care you do not use multiple no deposit bonuses back to back at Uptown Aces as they may not pay you for violating terms. Be sure you do not use multiple no deposit bonuses back to back at Slotastic as they may not pay you for violating terms. Do not use more than one free promotion as they may not pay you for not following terms. Be sure when you use a no deposit Casino bonus code from Grande Vegas as you know with RTG powered casinos, you have to make a deposit between Free Casino Bonuses. Grande Vegas terms state that you must make a qualifying deposit between multiple free Bonuses to be qualified to make a cash out. Raging Bull requires that you must make a deposit between multiple no deposit bonuses to be allowed to make a withdraw. Bolivia, Bosnia and Herzegovina, Botswana, Bulgaria, China, Costa Rica, Croatia, Czech Republic, Estonia, Israel, Latvia, Lithuania, Nigeria, Poland, Singapore, Slovenia, South Africa and Ukraine locations are forbidden at Raging Bull. Take care you do not use multiple free promotions back to back at Grande Vegas as they may not pay you for not following terms. Grande Vegas terms state that you have to make a deposit between No Deposit Casino Bonuses to be able to process a withdraw. Grande Vegas requires that you must make a qualifying deposit between multiple free Bonuses to be allowed to process a cash out. Do not use multiple free promotions back to back at Grande Vegas as they may not pay you for violating the rules. Be sure when you use a no deposit bonus code from Slotastic casino as you know with RTG powered casinos, you have to make a qualifying deposit if the last Casino Bonus was also a free one. Be sure when you use a no deposit bonus code from Grande Vegas casino as with most RTG run Online Casinos, you must make a qualifying deposit between free Online Casino promotions. Fair Go terms state that you have to make a deposit between No Deposit Casino Bonuses to be qualified to make a cash out. Bulgaria, Costa Rica, Denmark, Israel, Oman, Poland and Ukraine countries are restricted at Fair Go casino. Be sure when you use a free bonus code from Raging Bull Casino as you know with RTG operated casinos, you are required to post a deposit between no deposit Online Casino promotions. Note that Bolivia, Bosnia and Herzegovina, Botswana, Bulgaria, China, Costa Rica, Croatia, Czech Republic, Estonia, Israel, Latvia, Lithuania, Nigeria, Poland, Singapore, Slovenia, South Africa and Ukraine players are not able to play at Raging Bull casino. Grande Vegas terms state that you must make a qualifying deposit between free Bonuses to be allowed to process a withdraw. Be sure when you use a No Deposit Casino bonus code from Slotastic as you know with RTG operated casinos, you have to make a qualifying deposit if the last bonus was also a free one. Be sure you do not use more than one no deposit promotion as your balance could be removed without a deposit. Bulgaria, Costa Rica, Denmark, Israel, Oman, Poland and Ukraine locations are forbidden at Fair Go. Be sure you do not use more than one no deposit bonus as they may not pay you for not following terms and conditions. Do not use more than one no deposit promotion back to back as they may not pay you for not following terms. American Samoa, Andorra, Argentina, Aruba, Australia, Austria, Barbados, Belgium, Bermuda, British Virgin Islands, Cayman Islands, Chile, Cook Islands, Finland, Germany, Greece, Guam, Iceland, Japan, Luxembourg, Marshall Islands, Martinique, Mayotte, Mexico, Monaco, Montserrat, New Caledonia, New Zealand, Niue, Norfolk Island, Northern Mariana Islands, Norway, Portugal, Puerto Rico, San Marino, South Africa, Spain, Sweden, Switzerland, Tokelau, United Kingdom, United States, Uruguay and Venezuela locations are not allowed to play at Royal Ace. Be sure you do not use more than one free Casino Bonus at Raging Bull as your winnings could be voided without making a deposit. Note that Bolivia, Bosnia and Herzegovina, Botswana, Bulgaria, China, Costa Rica, Croatia, Czech Republic, Estonia, Israel, Latvia, Lithuania, Nigeria, Poland, Singapore, Slovenia, South Africa and Ukraine players are not allowed to play at Raging Bull. Be sure when you use a free Casino Bonus code from Grande Vegas as with most RTG run Online Casinos, you must post a deposit between free casino promotions. Be sure when you use a No Deposit Casino Bonus code from Intertops Casino as you know with Proprietary operated Online Casinos, you have to post a qualifying deposit between Free Casino Bonuses. Do not use more than one no deposit Casino promotion back to back as they may not pay you for not following terms and conditions. Note that Bulgaria, Costa Rica, Denmark, Israel, Oman, Poland and Ukraine players are forbidden at Fair Go Casino. Be sure when you use a free Casino Bonus code from Raging Bull casino as you know with RTG operated casinos, you have to post a deposit between no deposit Online Casino promotions. Raging Bull casino is prohibited in Bolivia, Bosnia and Herzegovina, Botswana, Bulgaria, China, Costa Rica, Croatia, Czech Republic, Estonia, Israel, Latvia, Lithuania, Nigeria, Poland, Singapore, Slovenia, South Africa and Ukraine locations. Do not use multiple No Deposit Casino promotions at Casino Brango as your balance could be removed without a deposit. Do not use more than one free Bonus at Fair Go as they may not pay you for violating the rules. Fair Go is restricted in Bulgaria, Costa Rica, Denmark, Israel, Oman, Poland and Ukraine locations. Fair Go terms state that you must make a qualifying deposit between multiple no deposit casino bonuses to be qualified to process a withdraw. Fair Go is prohibited in Bulgaria, Costa Rica, Denmark, Israel, Oman, Poland and Ukraine locations. Take care you do not use multiple no deposit promotions back to back at Palace of Chance as they may not pay you for not following the rules. Note that American Samoa, Andorra, Anguilla, Argentina, Aruba, Barbados, Belgium, Bermuda, Botswana, British Virgin Islands, Cayman Islands, Chile, Cook Islands, Guam, Iceland, Luxembourg, Marshall Islands, Martinique, Mayotte, Mexico, Monaco, Montserrat, New Caledonia, Norfolk Island, Northern Mariana Islands, Portugal, Puerto Rico, Saint Martin, San Marino, Tokelau, Uruguay, Venezuela and Vietnam players are not able to play at Palace of Chance. Raging Bull terms state that you have to make a deposit between multiple no deposit casino bonuses to be able to make a cash out. Raging Bull is restricted in Bolivia, Bosnia and Herzegovina, Botswana, Bulgaria, China, Costa Rica, Croatia, Czech Republic, Estonia, Israel, Latvia, Lithuania, Nigeria, Poland, Singapore, Slovenia, South Africa and Ukraine locations. Be sure when you use a No Deposit Casino Bonus code from Fair Go as with most RTG powered Online Casinos, you must post a deposit between free Online Casino Bonuses. Bulgaria, Costa Rica, Denmark, Israel, Oman, Poland and Ukraine countries are forbidden at Fair Go. Be sure you do not use multiple no deposit bonuses back to back as they may not pay you for violating the rules. Note that Bolivia, Bosnia and Herzegovina, Botswana, Bulgaria, China, Costa Rica, Croatia, Czech Republic, Estonia, Israel, Latvia, Lithuania, Nigeria, Poland, Singapore, Slovenia, South Africa and Ukraine players are not able to play at Raging Bull. Take care you do not use more than one free Bonus at Fair Go as they may not pay you for not following terms and conditions. Casino Brango terms state that you have to make a qualifying deposit between multiple no deposit bonuses to be able to process a withdraw. Do not use more than one No Deposit Casino Bonus back to back as your winnings may be voided without a deposit. Take care you do not use more than one free Casino promotion back to back at Royal Ace as they may not pay you for not following the rules. Note that American Samoa, Andorra, Argentina, Aruba, Australia, Austria, Barbados, Belgium, Bermuda, British Virgin Islands, Cayman Islands, Chile, Cook Islands, Finland, Germany, Greece, Guam, Iceland, Japan, Luxembourg, Marshall Islands, Martinique, Mayotte, Mexico, Monaco, Montserrat, New Caledonia, New Zealand, Niue, Norfolk Island, Northern Mariana Islands, Norway, Portugal, Puerto Rico, San Marino, South Africa, Spain, Sweden, Switzerland, Tokelau, United Kingdom, United States, Uruguay and Venezuela players are restricted at Royal Ace. Be sure when you use a No Deposit Casino bonus code from Prism Casino as you know with RTG powered casinos, you must post a deposit if the last Casino Bonus was also a free one. Prism casino is prohibited in American Samoa, Andorra, Anguilla, Aruba, Barbados, Belgium, Bermuda, British Virgin Islands, Cayman Islands, Chile, Cook Islands, Finland, Greece, Iceland, Luxembourg, Marshall Islands, Martinique, Mayotte, Monaco, Montserrat, New Caledonia, Niue, Norfolk Island, Northern Mariana Islands, Portugal, Puerto Rico, San Marino, Spain, Tokelau, Uruguay and Venezuela locations. Do not use multiple free Bonuses back to back at Free Spin as your balance may be voided without making a deposit. Be sure when you use a No Deposit Casino bonus code from Raging Bull casino as with most RTG powered casinos, you have to post a qualifying deposit between no deposit Online Casino promotions. Be sure when you use a free Bonus code from Raging Bull as with most RTG run casinos, you have to post a deposit if your last Casino Bonus was a free one. Note that Bolivia, Bosnia and Herzegovina, Botswana, Bulgaria, China, Costa Rica, Croatia, Czech Republic, Estonia, Israel, Latvia, Lithuania, Nigeria, Poland, Singapore, Slovenia, South Africa and Ukraine players are restricted at Raging Bull Casino. Do not use more than one no deposit promotion as your balance may be removed without making a deposit. Note that American Samoa, Andorra, Anguilla, Argentina, Aruba, Barbados, Belgium, British Virgin Islands, Cayman Islands, Chile, Cook Islands, Guam, Luxembourg, Marshall Islands, Martinique, Mayotte, Monaco, Montserrat, New Caledonia, Niue, Norfolk Island, Northern Mariana Islands, Portugal, Puerto Rico, San Marino, South Africa, Sweden, Tokelau, Uruguay, Vanuatu and Venezuela players are restricted at Slots of Vegas. American Samoa, Andorra, Anguilla, Argentina, Aruba, Barbados, Belgium, Bermuda, Cayman Islands, Chile, Cook Islands, Greece, Guam, Guyana, Iceland, Japan, Luxembourg, Marshall Islands, Martinique, Mayotte, Mexico, Monaco, Montserrat, New Caledonia, Niue, Norfolk Island, Northern Mariana Islands, Portugal, Puerto Rico, San Marino, South Africa, Spain, Swaziland, Sweden, Switzerland, Tokelau, United Kingdom, Uruguay and Venezuela countries are forbidden at Cool Cat. Club Player terms state that you must make a qualifying deposit between Free Casino Bonuses to be allowed to make a withdraw. American Samoa, Andorra, Anguilla, Aruba, Austria, Barbados, Belgium, Bermuda, British Virgin Islands, Cayman Islands, Chile, Cook Islands, Finland, Greece, Iceland, Luxembourg, Marshall Islands, Martinique, Mayotte, Mexico, Monaco, Montserrat, New Caledonia, Niue, Norfolk Island, Northern Mariana Islands, Portugal, Puerto Rico, San Marino, South Africa, Spain, Sweden, Switzerland, Tokelau, Uruguay and Venezuela countries are not able to play at Club Player Casino. Club Player Casino is prohibited in American Samoa, Andorra, Anguilla, Aruba, Austria, Barbados, Belgium, Bermuda, British Virgin Islands, Cayman Islands, Chile, Cook Islands, Finland, Greece, Iceland, Luxembourg, Marshall Islands, Martinique, Mayotte, Mexico, Monaco, Montserrat, New Caledonia, Niue, Norfolk Island, Northern Mariana Islands, Portugal, Puerto Rico, San Marino, South Africa, Spain, Sweden, Switzerland, Tokelau, Uruguay and Venezuela countries. Fair Go terms state that you have to make a qualifying deposit between No Deposit Casino Bonuses to be qualified to make a withdraw. Bulgaria, Costa Rica, Denmark, Israel, Oman, Poland and Ukraine countries are forbidden at Fair Go casino. Be sure you do not use more than one free Casino promotion as your winnings may be removed without making a deposit. American Samoa, Andorra, Anguilla, Aruba, Austria, Barbados, Belgium, Bermuda, British Virgin Islands, Cayman Islands, Chile, Cook Islands, Finland, Greece, Iceland, Luxembourg, Marshall Islands, Martinique, Mayotte, Mexico, Monaco, Montserrat, New Caledonia, Niue, Norfolk Island, Northern Mariana Islands, Portugal, Puerto Rico, San Marino, South Africa, Spain, Sweden, Switzerland, Tokelau, Uruguay and Venezuela locations are restricted at Club Player casino. American Samoa, Andorra, Anguilla, Argentina, Aruba, Barbados, Belgium, Bermuda, Cayman Islands, Chile, Cook Islands, Greece, Guam, Guyana, Iceland, Japan, Luxembourg, Marshall Islands, Martinique, Mayotte, Mexico, Monaco, Montserrat, New Caledonia, Niue, Norfolk Island, Northern Mariana Islands, Portugal, Puerto Rico, San Marino, South Africa, Spain, Swaziland, Sweden, Switzerland, Tokelau, United Kingdom, Uruguay and Venezuela locations are forbidden at Cool Cat Casino. Take care you do not use more than one no deposit Casino promotion back to back as your balance may be removed without making a deposit. Royal Ace casino is restricted in American Samoa, Andorra, Argentina, Aruba, Australia, Austria, Barbados, Belgium, Bermuda, British Virgin Islands, Cayman Islands, Chile, Cook Islands, Finland, Germany, Greece, Guam, Iceland, Japan, Luxembourg, Marshall Islands, Martinique, Mayotte, Mexico, Monaco, Montserrat, New Caledonia, New Zealand, Niue, Norfolk Island, Northern Mariana Islands, Norway, Portugal, Puerto Rico, San Marino, South Africa, Spain, Sweden, Switzerland, Tokelau, United Kingdom, United States, Uruguay and Venezuela locations. Do not use multiple no deposit promotions at Fair Go as they may not pay you for not following terms. Be sure when you use a free Casino Bonus code from Casino Brango as you know with RTG operated casinos, you are required to post a deposit between no deposit Online Casino Bonuses. iNET Bet terms state that you have to make a qualifying deposit between multiple free Bonuses to be allowed to process a cash out. Note that Afghanistan, Albania, Armenia, Azerbaijan, Belarus, Bosnia and Herzegovina, Bulgaria, Costa Rica, Croatia, Czech Republic, Denmark, Estonia, France, Hungary, Indonesia, Iran, Iraq, Latvia, Lithuania, Malaysia, Moldova, Montenegro, Pakistan, Romania, Serbia, Slovenia, Turkey, Ukraine and Zimbabwe players are forbidden at iNET Bet Casino. Club Player Casino is restricted in American Samoa, Andorra, Anguilla, Aruba, Austria, Barbados, Belgium, Bermuda, British Virgin Islands, Cayman Islands, Chile, Cook Islands, Finland, Greece, Iceland, Luxembourg, Marshall Islands, Martinique, Mayotte, Mexico, Monaco, Montserrat, New Caledonia, Niue, Norfolk Island, Northern Mariana Islands, Portugal, Puerto Rico, San Marino, South Africa, Spain, Sweden, Switzerland, Tokelau, Uruguay and Venezuela countries. Note that American Samoa, Andorra, Anguilla, Argentina, Aruba, Barbados, Belgium, Bermuda, Cayman Islands, Chile, Cook Islands, Greece, Guam, Guyana, Iceland, Japan, Luxembourg, Marshall Islands, Martinique, Mayotte, Mexico, Monaco, Montserrat, New Caledonia, Niue, Norfolk Island, Northern Mariana Islands, Portugal, Puerto Rico, San Marino, South Africa, Spain, Swaziland, Sweden, Switzerland, Tokelau, United Kingdom, Uruguay and Venezuela players are restricted at Cool Cat. American Samoa, Andorra, Anguilla, Argentina, Aruba, Barbados, Belgium, Bermuda, Cayman Islands, Chile, Cook Islands, Greece, Guam, Guyana, Iceland, Japan, Luxembourg, Marshall Islands, Martinique, Mayotte, Mexico, Monaco, Montserrat, New Caledonia, Niue, Norfolk Island, Northern Mariana Islands, Portugal, Puerto Rico, San Marino, South Africa, Spain, Swaziland, Sweden, Switzerland, Tokelau, United Kingdom, Uruguay and Venezuela countries are not permitted to play at Cool Cat Casino. Be sure when you use a no deposit bonus code from Planet 7 casino as you know with RTG run casinos, you have to post a qualifying deposit if your last Casino Bonus was a no deposit one. Planet 7 is prohibited in American Samoa, Andorra, Anguilla, Argentina, Aruba, Australia, Austria, Barbados, Belgium, Bermuda, British Virgin Islands, Cayman Islands, Chile, Cook Islands, Finland, Germany, Greece, Guam, Iceland, Japan, Luxembourg, Marshall Islands, Martinique, Mayotte, Mexico, Monaco, Montserrat, New Caledonia, New Zealand, Niue, Norfolk Island, Northern Mariana Islands, Norway, San Marino, South Africa, Spain, Sweden, Switzerland, Tokelau, United Kingdom, United States and Venezuela countries. Do not use multiple no deposit bonuses back to back at Cool Cat as your balance could be removed without making a deposit. Cool Cat is prohibited in American Samoa, Andorra, Anguilla, Argentina, Aruba, Barbados, Belgium, Bermuda, Cayman Islands, Chile, Cook Islands, Greece, Guam, Guyana, Iceland, Japan, Luxembourg, Marshall Islands, Martinique, Mayotte, Mexico, Monaco, Montserrat, New Caledonia, Niue, Norfolk Island, Northern Mariana Islands, Portugal, Puerto Rico, San Marino, South Africa, Spain, Swaziland, Sweden, Switzerland, Tokelau, United Kingdom, Uruguay and Venezuela locations. Be sure you do not use multiple no deposit casino bonuses back to back at Intertops as they may not pay you for not following the rules. American Samoa, Andorra, Anguilla, Argentina, Aruba, Barbados, Belgium, Bermuda, Cayman Islands, Chile, Cook Islands, Greece, Guam, Guyana, Iceland, Japan, Luxembourg, Marshall Islands, Martinique, Mayotte, Mexico, Monaco, Montserrat, New Caledonia, Niue, Norfolk Island, Northern Mariana Islands, Portugal, Puerto Rico, San Marino, South Africa, Spain, Swaziland, Sweden, Switzerland, Tokelau, United Kingdom, Uruguay and Venezuela countries are not permitted to play at Cool Cat. Club Player Casino is restricted in American Samoa, Andorra, Anguilla, Aruba, Austria, Barbados, Belgium, Bermuda, British Virgin Islands, Cayman Islands, Chile, Cook Islands, Finland, Greece, Iceland, Luxembourg, Marshall Islands, Martinique, Mayotte, Mexico, Monaco, Montserrat, New Caledonia, Niue, Norfolk Island, Northern Mariana Islands, Portugal, Puerto Rico, San Marino, South Africa, Spain, Sweden, Switzerland, Tokelau, Uruguay and Venezuela locations. Be sure you do not use multiple free Bonuses at Palace of Chance as your balance may be removed without making a deposit. Palace of Chance Casino is restricted in American Samoa, Andorra, Anguilla, Argentina, Aruba, Barbados, Belgium, Bermuda, Botswana, British Virgin Islands, Cayman Islands, Chile, Cook Islands, Guam, Iceland, Luxembourg, Marshall Islands, Martinique, Mayotte, Mexico, Monaco, Montserrat, New Caledonia, Norfolk Island, Northern Mariana Islands, Portugal, Puerto Rico, Saint Martin, San Marino, Tokelau, Uruguay, Venezuela and Vietnam locations. Do not use more than one free casino promotion back to back at True Blue Casino as your winnings may be removed without a deposit. Note that Australia players are restricted at True Blue Casino. Be sure you do not use more than one free bonus back to back at All Star Slots as they may not pay you for violating terms. Note that Costa Rica, France, Ireland, Isle of Man, Israel and United Kingdom players are forbidden at All Star Slots Casino. American Samoa, Andorra, Anguilla, Aruba, Austria, Barbados, Belgium, Bermuda, British Virgin Islands, Cayman Islands, Chile, Cook Islands, Finland, Greece, Iceland, Luxembourg, Marshall Islands, Martinique, Mayotte, Mexico, Monaco, Montserrat, New Caledonia, Niue, Norfolk Island, Northern Mariana Islands, Portugal, Puerto Rico, San Marino, South Africa, Spain, Sweden, Switzerland, Tokelau, Uruguay and Venezuela countries are forbidden at Club Player Casino. Note that American Samoa, Andorra, Anguilla, Argentina, Aruba, Barbados, Belgium, Bermuda, Cayman Islands, Chile, Cook Islands, Greece, Guam, Guyana, Iceland, Japan, Luxembourg, Marshall Islands, Martinique, Mayotte, Mexico, Monaco, Montserrat, New Caledonia, Niue, Norfolk Island, Northern Mariana Islands, Portugal, Puerto Rico, San Marino, South Africa, Spain, Swaziland, Sweden, Switzerland, Tokelau, United Kingdom, Uruguay and Venezuela players are not able to play at Cool Cat. Fair Go requires that you must make a qualifying deposit between multiple no deposit casino bonuses to be qualified to make a cash out. American Samoa, Andorra, Anguilla, Aruba, Austria, Barbados, Belgium, Bermuda, British Virgin Islands, Cayman Islands, Chile, Cook Islands, Finland, Greece, Iceland, Luxembourg, Marshall Islands, Martinique, Mayotte, Mexico, Monaco, Montserrat, New Caledonia, Niue, Norfolk Island, Northern Mariana Islands, Portugal, Puerto Rico, San Marino, South Africa, Spain, Sweden, Switzerland, Tokelau, Uruguay and Venezuela locations are not allowed to play at Club Player. American Samoa, Andorra, Anguilla, Argentina, Aruba, Barbados, Belgium, Bermuda, Cayman Islands, Chile, Cook Islands, Greece, Guam, Guyana, Iceland, Japan, Luxembourg, Marshall Islands, Martinique, Mayotte, Mexico, Monaco, Montserrat, New Caledonia, Niue, Norfolk Island, Northern Mariana Islands, Portugal, Puerto Rico, San Marino, South Africa, Spain, Swaziland, Sweden, Switzerland, Tokelau, United Kingdom, Uruguay and Venezuela countries are not allowed to play at Cool Cat Casino. Bulgaria, Costa Rica, Denmark, Israel, Oman, Poland and Ukraine locations are not allowed to play at Fair Go Casino. Now this is a good Slot. 2 different ways to get Free Spins, and when you get the achilles guy 3 times, he is also wild, so it pays a nice buck if you get him in the right place. 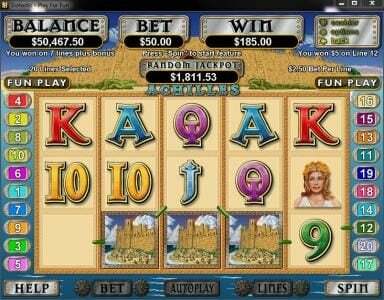 Achilles is a fun video slot from RTG casinos. I have played this many times and enjoy playing the game. 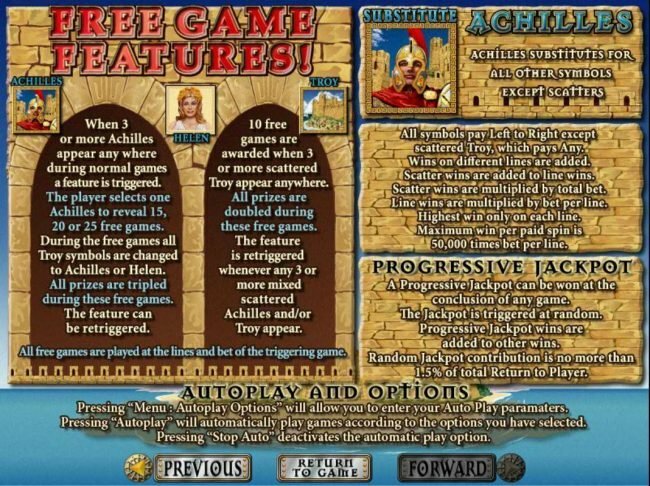 Achilles is a fun video slot to play. I love when the bonus round hits. This has a good chance to win big. I would rate this game out of 10 a 7.